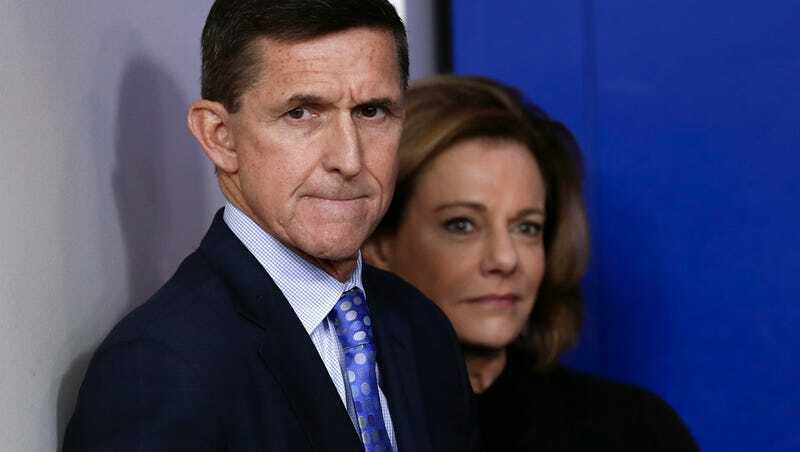 The White House finds itself in turmoil in the wake of Friday’s bombshell news that Trump’s former national security adviser Michael Flynn pleaded guilty to making false statements to the FBI and was cooperating with Special Prosecutor Robert Mueller’s investigation. Speculation regarding the identity of unnamed Trump campaign officials abounds, with The Washington Post reporting on Friday that: “Former Deputy National Security Adviser KT McFarland is an unnamed senior official referred to in the court papers filed in the Michael Flynn case,” according to “two former officials” who served on Trump’s transition team. McFarland is identified in court papers filed Friday as a “senior transition” official. Papers filed by special counsel Robert Mueller show Flynn contacted McFarland on Dec. 29, 2016, to discuss what, if anything, he would communicate to the Russians about the sanctions. Flynn admitted Friday to lying to the FBI about the contents of that conversation. Amid these mounting concerns regarding McFarland, a Fox News op-ed penned by her on 10 September 2013 takes on new relevance. That op-ed, titled: “Putin is the one who really deserves that Nobel Peace Prize,” claimed that Russian President Vladimir Putin deserved a Nobel Peace prize and not President Barack Obama. The fact is Obama seemed headed for an attack on Syria that no one wanted and few thought would succeed. Most thought it would only end in disaster, either with the U.S. drawn into an attack/retaliation cycle of escalation that could go on for years and spread into a regional war, or result in the overthrow of President Assad by an Al Qaeda affiliated rebels. While the Russians may have toyed with the idea of letting American get bogged down in yet another losing Middle East war, they didn’t want to risk a war that might pull them in, or lose control of the Assad government to radical Sunni jihadists. So Putin stepped in and threw Obama a lifeline. The Washington press corps will no doubt believe him, as usual, and lavish their usual praise. But the world knows that Vladimir Putin is the one who really deserves that Nobel Peace Prize. It turns out that leading from behind left a big opening up front. Putin stepped right in. And Obama still hasn’t figured it out. Additionally, The Independent reported on McFarland’s op-ed piece on 29 November 2016 shortly after the election. In that article, they also reported on a series of controversial remarks made by Trump’s then newly-appointed Deputy National Security Advisor. McFarland is currently awaiting Senate confirmation as ambassador to Singapore.